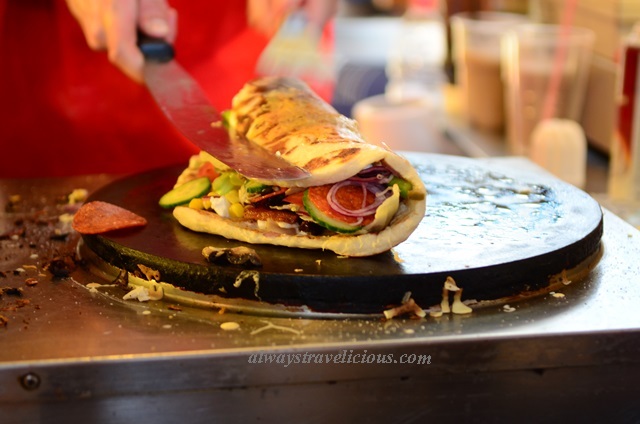 Great Market Hall @ Budapest, Hungary - Always Travelicious ! The Great Market Hall or Central Market in Budapest is more than a 100 years old built in 1897. 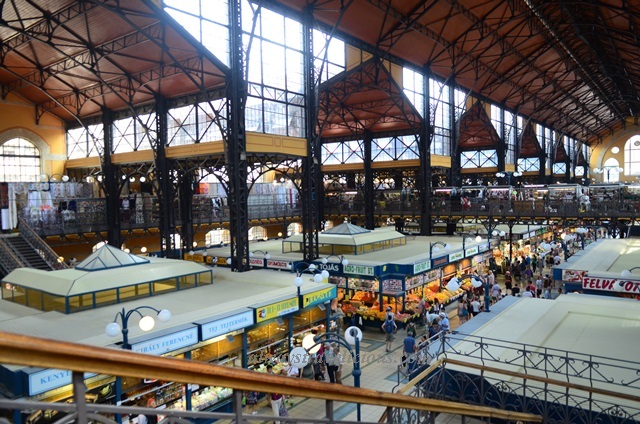 With its yellow and green Zsolnay tiling that ornate the roof, the three floored market with high ceiling is a stunning place to do a bit of shopping and indulge in local Hungarian cuisine. 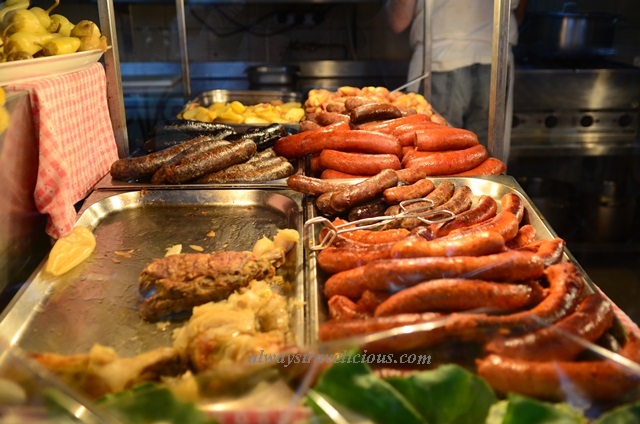 meats and sausages – I think these white chunks are pure fat ? – what do the Hungarians do with it? I was really excited to see the Dobos Torte because it was something I tried to bake years ago without knowing what it tastes like and now I can finally try the flavor of this classic Hungarian delight. The glossy layer on top is caramel, still sticky to the touch yet it crunches as you take a bite into it – this part is the only part that’s worth mentioning. The alternating layers of chocolate cream and dry cake layer are disappointing. I guess I probably shouldn’t be too stringent because the cake was only 0.50 Euros. 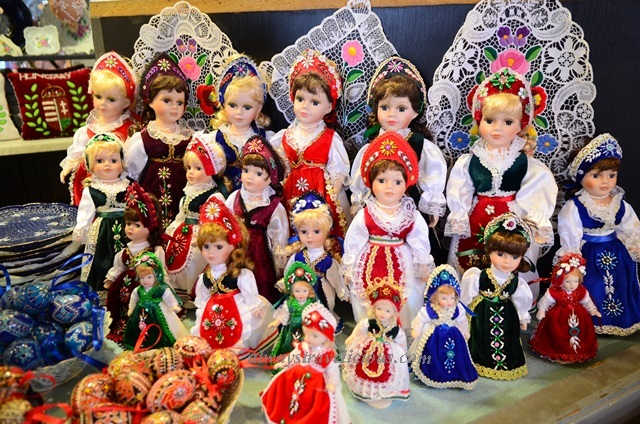 As you go up to the first floor, souvenirs and local Hungarian food are available. The food section is the most sought after section of the market, especially during lunch hours. I paced back and forth before settling on the wrapped cabbage because I wanted something light. Despite looking like a rather averaged sized cabbage in the display window, a plateful arrived with the stuffed cabbage almost the size of half the plate, with paprika flavored sauerkraut filling up the other half. So it wasn’t exactly “light” as I thought (1190 HUF, about 4 Euros). Everything you see here is is laced with paprika, from the cabbage to the stuffing of meat + rice to the sauerkraut; I enjoyed the sour dish with heavy stuffing. It was a pity that I could only try one thing! This langos store seemed to be very popular as there were a lot of people queuing for it. The folded up version of the langos is called “rustic langos”! 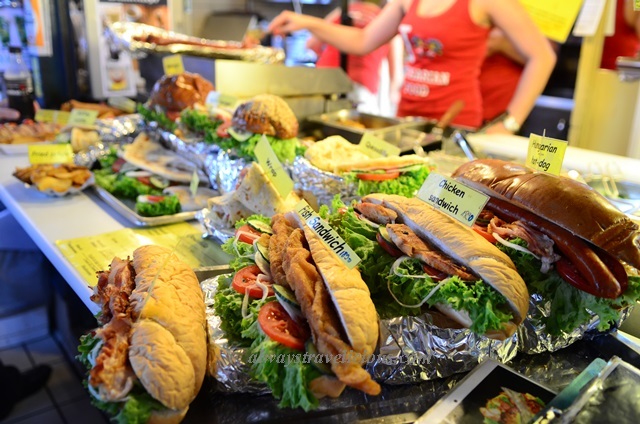 These copiously stuffed sandwiches looked heavenly. Choices for sausages are plenty. Goulash soup which I am still yet to try. And there’s always something for the sweet toothed. These sweet pancakes are the size of small pizzas and the ingredients are used lavishly – check out the 5 kg nutella bottle at the corner! Address: Vámház körút 1-3; Budapest, Hungary; 1093. Opening Hours : Mon 6 am – 5 pm. Tues – Fri 6 am – 6 pm. Closed on Sundays. Getting there : Via Tram 2, 47, 49, trolley bus 83. This will definitely be in my places to visit when I’m in Budapest tomorrow! Can’t wait for it! Try the langos for me. I had no more space for it ! The shirts are very pretty indeed and so are the food ! There were some men’s winter jackets with embroidery too that were very pretty. 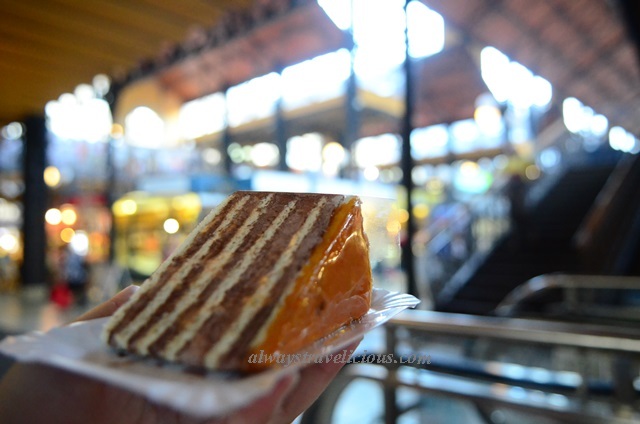 I searched high and low for a special book on Hungarian and Austrian coffee houses and when I did find one I was mesmerised by the enchanting interiors and continental treats including the famed Dobos Torte. Lovely travel post, KJ, you’ve inspired me to Budapest to my list of must-sees. Thanks SG. The cafes are among the most opulent , even more so than the ones in Vienna. I hope you get to visit it soon and do go for the thermal baths too. There are some great pictures here KJ, I love the sausages.